Motorcycle racer Nicky Hayden succumbed to injuries from a bicycle crash on Monday. He was 35. Hayden was training on his bicycle on the Rimini coast in Italy on Wednesday when he was struck by a car. He was taken to a local hospital with chest and head trauma, and was then transferred to the Bufalini Hospital in Cesena. The hospital released a medical bulletin on Monday announcing the death, having said last week that Hayden had severe cerebral damage and multiple traumatic injuries. Nicknamed the “Kentucky Kid,” Hayden had worked his way up to the premier class of MotoGP by 2003, when he was just 21 years old, teaming up with Valentino Rossi at Repsol Honda. Just three years later, Hayden would win the MotoGP World Championship after a season-long battle with Rossi. 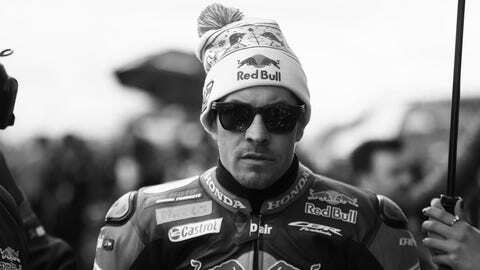 Hayden remained in MotoGP full-time until 2015 but was unable to make it back to the top step of the podium again. In 2016, Hayden switched to the Superbike World Championship where he took a race win in Malaysia. He was 13th in the points following his latest Superbike race at Imola this year.